Not your average foodie event, Out of the Kitchen, held on Sunday, April 7th, boasted 21 of South Florida’s most popular chefs cooking tableside all in one grand ballroom at the St. Regis Bal Harbour. Seated at intimate tables of 12, adventurous diners—who didn’t know what they were being served until that very night—were treated to an interactive experience where they could engage with these culinary artists as they were creating innovative, three-course meals. And it was all to benefit the Diabetes Research Institute (DRI) and its mission to find a cure. Upon arrival, Event Chairs Amy and Scott Greenwald and Tammy and Steve Klein welcomed guests to the cocktail party, where they drank in breathtaking ocean views, along with martinis and passed Prosecco. With each step forward, the food offerings seemed to multiply, as diners noshed on lite bites from pop-up restaurants by BH Burger Bar, 26 Sushi & Tapas, Seawell Fish n' Oyster, The Jim & Neesie, and the BB&T Center/Florida Panthers. During the program, Bravo “Top Chef” alum Chef Sam Talbot shared his personal story about living with type 1 diabetes, and local philanthropist Andria Holtz, who has a son with type 1 diabetes, led a heartfelt fund-a-cure that raised $250,000 for the DRI in a matter of minutes, bringing the evening’s total to close to $380,000. Watch the touching video that was shown the evening of the event below. Next it was time for the much-anticipated main event! 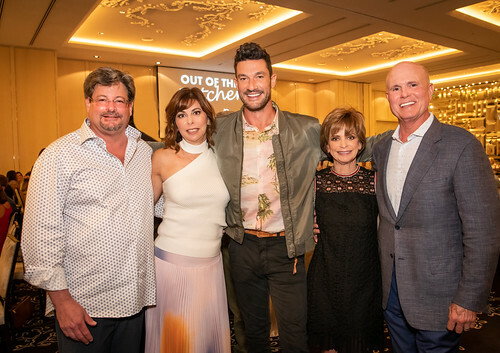 Local celebrity chefs, Jeremy Ford of Stubborn Seed, David Hackett of the Biltmore Coral Gables, and Norman Van Aken of Three, served as culinary chairs while cooking up some tantalizing treats for their tables, alongside a host of South Florida’s hottest chefs. And—oh—the desserts! They came in towers of macaroons, mountains of cookies and biscotti, slices of pie, and super scoops of ice cream, courtesy of Fireman Derek’s Bake Shop, MadLab Creamery, Phenomenon Nitrogen Ice Cream & Bake Shop, Mo Scotti, and Sweet Guilt by Angelica Lenox. To-go boxes were the must-have takeaways for those that just couldn’t eat another bite that night. Top sponsors included: Amy & Scott Greenwald, the Stacy Joy Goodman Memorial Foundation, Sabrina Gallo/Greenberg Traurig, Becton Dickinson, Stearns Weaver Miller Weissler Alhadeff & Sitterson, P.A., Wild Oceans, Gerson, Preston, Klein, Lips, Eisenberg & Gelber, P.A. and the Schechter and Eckstein Families. Photos by Andrew Milne Photography.